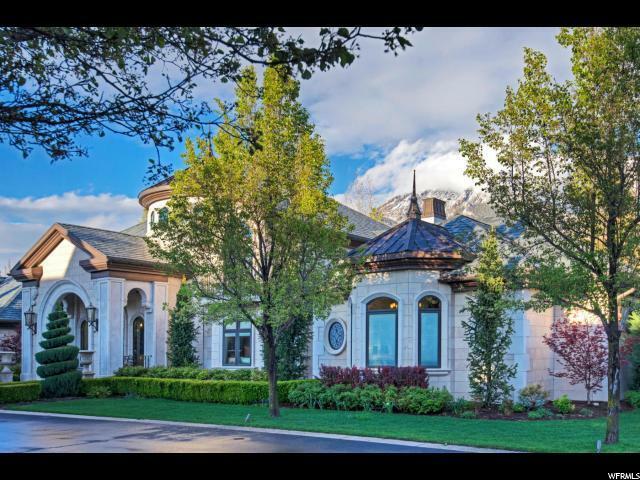 This Grand Italian Villa is nestled in a gorgeous gated community of exquisite estates in the heart of Holladay! The imported limestone exterior and copper accents are enhanced by a stunning slate roof surrounded by luxuriant landscaping, .58 acres, and a very quiet/secure setting. Cobbled paved terraces and driveway, water feature, putting green, hot tub, in ground trampoline, and a basement entrance become an included bonus for a buyer. The massive mahogany and glass front doors lead into a domed entry offering a limestone staircase, bronze railings, limestone flooring, and marble columns thru out. Stunning handcrafted kitchen cabinets, central island, rich carved wood corbels and trim molding, granite slabs, large walk-in pantry are just the beginning. Attached great room includes dramatic ribbon cut beamed ceilings, European fireplace, and custom media center. The double height library is adorned with cherry wood built-ins. Large double mahogany doors lead into the amazing master suite offering solid carved stone fireplace, coved and domed ceilings, spa/steam shower, step up jetted tub, massive walk-in closet, and etched glass doors to the backyard patio. Incredible basement of entertaining with a full kitchen, theatre room with custom leather reclining chairs, and additional game room area. This magnificent home has been thoroughly planned out and designed with meticulous detail to living space and finish work...it is definitely one of a kind and a must see! Listing provided courtesy of Summit Sotheby's International Realty - Salt Lake. Information deemed reliable but not guaranteed accurate. Buyer to verify all information. © 2019 Wasatch Front Regional Multiple Listing Service, Inc., All Rights Reserved. Based on information from the Wasatch Front Regional Multiple Listing Service, Inc. as of 2019-04-18T16:36:20.29. All data, including all measurements and calculations of area, is obtained from various sources and has not been, and will not be, verified by broker or the MLS. All information should be independently reviewed and verified for accuracy. Properties may or may not be listed by the office/agent presenting the information.The information provided is for consumers' personal, non-commercial use and may not be used for any purpose other than to identify prospective properties consumers may be interested in purchasing. Information deemed reliable but not guaranteed accurate. Buyer to verify all information.